Rafting at Shiki Tour (四季の旅・ラフティング) is one of the most exciting water activities in Japanese summer. The rafting is recreational outdoor activity on the river. Splashing water and exciting ride on raft going through Tone river, Gunma Prefecture. This tour offers about 90 min. on the boat, lunch and Onsen. It is very and reasonable from Shinjuku. This tour includes both way bus, rafting, pasta lunch and Onsen. The guide will be taking care of everything. The tour goes to Minakami, northern Gunma Prefecture. The raft travel though Tone river that is the longest river in Japan. It has a pure water with many splash points. You can enjoy great water activities by rafting. 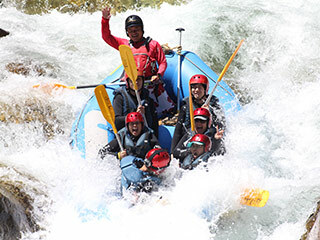 The rafting is the outdoor activities that riding through the hard river with 8 people boat. You will spend about 90 min. on the boat. First, you give your all valuables to the guide and change the clothing to wet suit at the base house. Recieve helmets and water shoes. Then, you will give all the belonging to the guide. They will have photographers for you to take pictures. You will move to other location by another bus. In the bus, the rafting guide will lecture you about safety instruction and how to use the tools. There are some English speaking guides. So, ask them if you want to join in English. Move to the river. Practicing how to swim the river with safety suit. Final lecture for on the boat. The ridding time on the rafting is about 90 min. After rafting, the guide take you back at the parking. You pick up your belonging and change your clothing. You can take a show, but don't spend too much time because you will have lunch time right after this. Don't forget to pick up your valuables. Lunch (BBQ) place is located nearby the base house. You will have about 60 min. Please clean up the dishes after eating lunch. Then, move to Onsen. Exchange the key of the shoes to clothing locker at the cashier. You will have about 60 min. at Onsen. (If you don't like Onsen, you can just relax at the resting area. Then, bus takes you back to Shinjuku Station. Swimming wear, towels and extra under wears. 7:45 the bus leave Shinjuku. 8:45 stop for restroom break. 11:00 arrive at Minakami Rafting Base House. 18:00 stop for restroom break. August 20 (Thursday), August 23 (day), August 27 (Thursday), September 3 (Thursday), September 5 (Saturday), September 10 (Thursday), September the 13th (day), September 17 (Thursday).